Kyeong Ah Jeong, a Ph.D. student of color lab presented her work at the ACM CHI’ 18, and the full paper is published in the proceedings of the 2018 CHI Conference on Human Factors in Computing Systems. In the paper, the findings and qualitative analyses are provided based on the workshop with designers exploring automobile lighting design ideas with c.light. 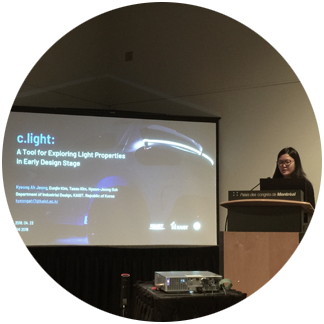 As a part of her PhD dissertation about an proposing systematic product light design process, it tries to reveal the value of c.light, a lighting prototyping tool, where this tool is applied at the early design stage of product light development. Although a light becomes an important design element, there are little techniques available to explore shapes and light effects in early design stages. We present c.light, a design tool that consists of a set of modules and a mobile application for visualizing the light in a physical world. It allows designers to easily fabricate both tangible and intangible properties of a light without a technical barrier. We analyzed how c.light contributes to the ideation process of light design through a workshop. The results showed that c.light largely expands designers’ capability to manipulate intangible properties of light and, by doing so, it facilitates collaborative and inverted ideation process in early design stages. It is expected that the results of this study could enhance our understanding of how designers manipulate light in a physical world in early design stages and could be a good stepping stone for future tool development.